BASF has been a pioneer among bar associations working to ensure workplace equality for lesbian, gay, bisexual, and transgender (LGBT) lawyers. Recognizing the benefits that LGBT law students and young lawyers receive when afforded opportunities to network with other LGBT lawyers and successful partners, BASF, in collaboration with BALIF and other local minority bar associations will be holding a LGBT Partners, Associates and Counsel Reception on June 22nd. Please RSVP online by June 19th. 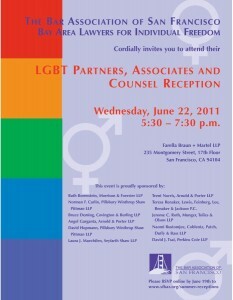 Questions may be directed to diversityevents@sfbar.org, please write “LGBT Reception” in the subject line.